Superheroes are not going away any time soon, and for proof of that you need look no further than the CW, a channel that specializes in young adult drama and will, in just over a month, release their third currently ongoing superhero show, which is about a time traveling Justice League International. The CW have created a shared DC Universe for television that is knocking on the door of the the major networks in terms of ratings, and it’s no surprise: these shows are really good shows, and have been surprisingly great adaptations of the comics that inspire them. But there’s one area in particular I want to stop to look at, and that is perhaps the most superhero-esque area of focus: costume design. So let’s take a look at the best, and worst outfits the CW superheroes have sported within the last four years. This one sort of counts and sort of doesn’t, so I’m dropping her into the runner up category. It’s character design more than costume that’s at fault here; the New 52’s decision to turn Amanda Waller, one of the few individuals of the comic book industry to not normally look like a supermodel, into someone who looks like a supermodel was never a good idea, and is one that actively makes her less menacing and interesting. Aging her down doesn’t help either, as her background as a widowed mother is one of her more fascinating attributes. The current design of her was a terrible idea in the comics, and it was a terrible idea to make her look like this on TV. What makes it even worse is that actress Cynthia Addai Robinson is actually doing a wonderful job with the material she’s given, and this is wasting her talents on a poorly written iteration of a character she should not be playing. Funny thing was, this costume wasn’t that bad in context at the time of her first appearance, but as the show grew into better and better designs, this one started to stand out poorly for a few reasons. Firstly, it has next to nothing to do with the comic’s costume. As nice as it was to finally see a character wearing a mask instead of greasepaint (more on that later), it’s still a little frustrating that this was the wrong mask for this character (comics’ Huntress wears a taller, pointier mask). The lack of the cross motif (aside from a necklace) and any real costume elements (other than some subtle use of purple) made this a costume that’s disappointing now that we’re getting so many better costumes, even if it felt like a step up from the point in the show where a white wig was the extent of someone’s design. I don’t hate this costume, but I really can’t say I like it. Like a few other characters, it’s clear that what they did here was pick out the single most iconic element of the comics design and adapt that, then forget about the rest of it; in this case they kept nothing but the glowing, asymmetrical logo and the general, uh, fire. But unlike, say, Deadshot where the minimal design more or less worked, this resulted in a guy who looked like he strapped a couple LED’s to a hoodie and called it his supersuit. I get that Firestorm has a fairly outdated costume (were pointed shoulders ever really in style), but this design has always felt like it suffered from a lack of effort. There’s a couple issues I’ve got with this design. I’ve never been a big fan of the hood based Green Arrow designs as I prefer the hat myself. The costume beyond the green hood is rather dull and boring, with little in the way of details other than black leather. But really, the big issue here is the mask. Or rather, greasepaint. The painted on mask wasn’t a good look for Black Canary on Smallville, and it certainly wasn’t a good look for the lead superhero of this show. When Oliver finally donned an actual domino mask that fateful December in season two, it was a Christmas gift to us all. All that said, there is one area where Season 1 Oliver has a leg up on the current iteration: the bow. I stand by my belief that Hawkeye rocks a snappy, snazzy, modern compound bow, but Green Arrow should always carry a classic recurve. And Boxing Glove Arrows. There was much excitement when it was revealed that Diggle would be getting a costume and a codename this season, but when the official images showed up displaying it, it turned out to be a pretty big disappointment. For starters, the helmet/mask just plain looks ridiculous. Comparisons to Magneto have abounded since its unveiling, and it takes a pretty loved and respected character and makes him look horribly undignified. But perhaps making the whole situation worse is the multitude of ways it could’ve been better. We were probably never going to get Diggle as the surprisingly great adaptation of John Stewart the internet started wishing for, but characters like Vigilante and Guardian were being thrown around as potential sources of inspiration, and taking one look at Guardian’s classic helmet and and generally fantastic Jack Kirby design, it’s hard not to long for what might have been. Diggle’s costume may be boring and kind of hideous, but at least it’s a costume on a character original to the show. Laurel is, ostensibly at least, an adaptation of Black Canary, one of DC’s oldest and greatest female superheroes, and her costume here is boring and hideous and looks nothing like any Canary costume in the comics. I understand that there are some potential issues with the fishnets on bare legs and the swimsuit cut leotard of the comics, but if you’re looking for a way to adapt that costume while updating it to make it more appropriate to this show and setting, this here is an exercise in how to miss nearly every note completely. No effort has been made to reference any particular shape or iconography from any Black Canary costume of the comics other than the existence of a black leather jacket in some form; the buckles everywhere look unwieldy and ridiculous; the excessively black costume makes a mockery of general color blocking and makes her hard to follow in the dimly lit night time fights of the show. The one little detail that feels possibly like some element of Black Canary from the comics is the lace (not fishnet) found in the gloves and shoulders beneath the jacket; this was actually actress Katie Cassidy’s suggestion, so kudos to her for adding one little piece of personality to an otherwise terrible costume. Well, anyone can complain about poor adaptations, and I do my fair share of that on a pretty regular basis. But criticism is nothing without some constructive points, so let’s look at the best examples of CW superhero costumes to see what they’re doing right and how they can do more of it. Our top 10 list in just a moment, but first some runners up. Just because I wish he was wearing a more accurate set of goggles doesn’t mean I don’t appreciate the accomplishment of having a legitimate (and incredibly entertaining) supervillain wear a fur lined parka. This is the second attempt made at Captain Cold in live action, and considering the previous version was an albino hitman with dark circle sunglasses, the bar was not high. Not only did they accept the challenge of adapting at least his most important (and also ridiculous) fashion statement, they made him look good while doing it. Another in the category of not really wearing a costume, but unlike a lot of other minor villains of the week, Bronze Tiger’s wardrobe actually speaks to his character quite well. Of particular note, the nicely colored red/brown leather jacket with strategically placed ‘tiger stripe’ zippers, and of course his bladed brass knuckle weapons. Add to this an extremely well cast Michael Jai White, and you’ve got a pretty fantastic visual interpretation of the character. The award for Most Improved clearly goes to Green Arrow. After having gone through a number of minor updates throughout the first three seasons, Green Arrow finally got a big costume overhaul alongside his new moniker, and boy does it look good. While I continue to wish he’d wear the hat (and return to the recurve), this costume actually does a pretty good job of recalling several elements from various Green Arrow costumes. The detailing on the body looks good, the gauntlets are slick, and the bare arms are a welcome change. While this costume doesn’t make the actual top 10 (because there are some really good costumes that are still ahead of it), it feels necessary to note how far this show has improved from four years ago. The runner up for Most Improved would also go the the new Firestorm as he will be appearing on Legends of Tomorrow. Where Ronnie Raymond had basically no real costume to speak of and only a couple key elements adapted from the comics’ design, Jay Jackson succeeds by the simple definition of actually having a costume. Better yet, it makes great use of alternating bright red and yellow to add some color to the look. And as the coup de grace, you’ve got the improved fire graphics that were visible in his last appearance on Flash: Ronnie, from the shoulders up, was indiscriminately on fire. When depicting Jax, on the other hand, the special effects team limited the fire to specifically the top and back of his head. It’s a little detail, but the result makes at least his head look more distinctly like comic book Firestorm than Ronnie ever did, before you even get to the new duds. King Shark is simple: he’s a shark. While it doesn’t seem like something you could easily get wrong, DC has been more than willing to prove they were capable of just that, with Assault on Arkham’s terrible version (not enough shark! ), and the New 52’s redesign (wrong shark!). The Flash, in 30 seconds, didn’t just show off how easy it is to do King Shark right (so, so right), they showed us a glimpse into a better world, where people just inherently got the appeal of characters like King Shark. Also, just remember this is a show with a limited television budget, and they spent who knows how much on rendering and animating a 14 foot tall man shark for about 30 seconds worth of footage; it’s good to see a show with its priorities straight. Specifically the Season 2 version, because yep: the brighter red and the white logo really does make it pop. Barry Allen’s Flash costume goes down in comic book history as one of the best superhero costumes around, to the point that when Barry died and passed on his mantle to his successor, Wally West, the costume made next to no changes. The sleek simplicity of solid red and that white and yellow logo speak wonders for fairly minimal design, and when it came time to adapt him into live action for our modern, somewhat superhero spoiled age, the show delivers pretty well. While I personally might tone down the extra texture across the body (and particularly the “angry eyebrow” lightning bolts on the forehead) the costume really shines in motion, when the yellow lightning speed effects can be seen. Sadly, the lack of bright yellow highlights in the belt and boots prevent this costume from scoring higher (once more, color blocking is your friend), this costume is pretty dang good. 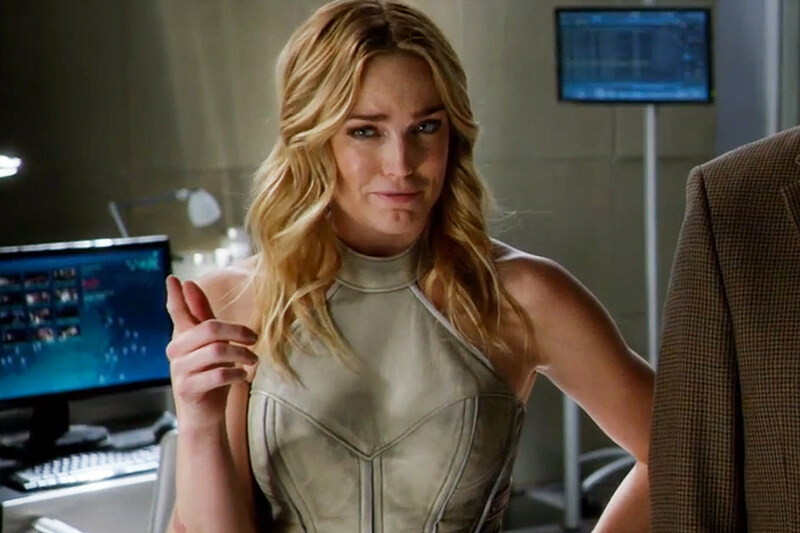 If Laurel’s costume is an exercise in a poor updating of a potentially problematic costume, Sara’s first outfit is a much more successful attempt. As an adaptation specifically of Golden Age Black Canary’s outfit, this is a pretty accurate look, being nearly identical from the waist up. Another notable element is the criss cross design detailed into the leggings, emulating if not outright adapting the iconic fishnet stockings associated with the character. But perhaps the most successful design element in play here is the use of color blocking, albeit mostly through costume negative space. Where Laure’s outfit is predominantly, overpoweringly black, this costume breaks up all the black with the portions of bare skin: the wrists, the upper chest, her face. The blonde hair adds a nice accent color, and the black mask ties the whole thing together quite nicely. Biggest flaws: the nod to the fishnets in the legging details are nice, but are difficult to see in most of Arrow’s dimly lit costume scenes; further, and most importantly, the cleavage is a bit on the extreme side, to a sometimes jarringly unrealistic degree. A little fan service is one thing, but putting your superheroine in constant danger of a pop out is another. 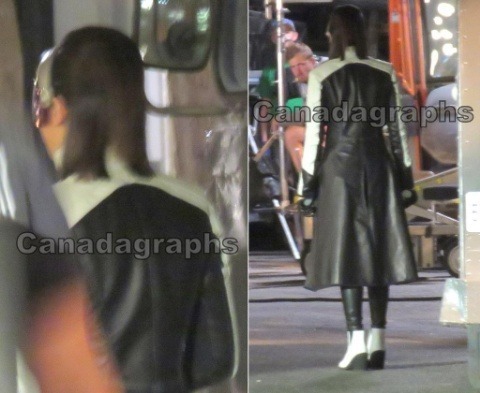 Roy’s costume was nice and all, but Thea definitely wears it better, for a couple reasons. The black highlights throughout the costume help break up the overwhelming red of Roy’s version. The laces across the chest look fantastic, and I hope to someday see a similar element added to Oliver’s costume. Thea actually wears the hood itself better than I’d say all of the other archers on this show. While I agree with (and am enthused by) actress Willa Holland’s desire for a little yellow cape to better match the comics counterpart (which is awesome to hear from an actor in this kind of a role), this still remains one of Arrow’s best costumes. Arrow managed to to give us not just one, but two versions of Slade’s costume, and both of them were pretty great. While Island Deathstroke turned out to actually be Wintergreen wearing Slade’s more familiar garb, the design featured a pretty good mask, a recognizable image of Slade’s classic silhouette, and a splash of color with the highlighted orange cannisters strapped across his chest (what are those, explosives? Supplies? I don’t really care, they just look good). Slade’s modern costume, however, was absolutely fantastic, with a more vibrant version of the one eyed mask, and a hint of blue across his armor plates. This was a truly menacing, modern version of a comic book classic, and it was one of the first costumes of these shows to truly capture the feel of its character. We’ve mostly looked at costumes that were adaptations of specific comic book counterparts, but the shows haven’t spent too much time crafting wholly original looks. Turns out when they do, they are $&%#ing terrifying. Admittedly, Zoom’s costume is mostly identical to Barry’s, just in a black variant, but the biggest differences come from the mask, where HOLY CRAP, THERE ARE HORRIBLE RAGGED STRETCH HOLES WHERE THE MOUTH SHOULD BE! The more skin-like appearance of the mask in general is what really sets this design apart, with the furrowed brow and wrinkly jaw. Even when in motion, the deep black, shark like eyes and the eerie blue lightning make Zoom a horror movie speedster from your darkest nightmare. And he is wonderful. There’s multiple elements in play that make Jay Garrick’s costume here one of the very best. First is how fantastically faithful the adaptation is; Garrick has a relatively simple design, one that calls back a time period before superhero costumes had really started to differentiate themselves from the pulp heroes. In his case, he has a shirt, pants, and a helmet, and that’s basically it. For the show to adhere to those elements without too much desire for updating is itself a wonder (unlike the New 52 version), and the fact that his helmet is one of the most perfect recreations of a comic book item onto screen, down to that whimsical little tilt when worn, really makes this a costume to get exited over. But the truly great thing about this costume are the embellishments. Where a lot of other costumes fall prey to busy over texturing and unnecessary piping, the embellishments here all feel like they have purpose, namely, in creating a look that calls back a pulpish, 40’s aesthetic, one which is a dominant visual presence for all of Earth-2. This has been one of the best visually creative decisions in all of the CW costume designs, and Jay Garrick could very easily be the number one spot here if his lightning bolt was just a little bit bolder and the colors were just a little bit brighter. Regardless of what the Sinestro Corps will try to tell you, yellow is not an intimidating color. The phrase, “The Man in the Yellow Suit” will always make me think first of Curious George, and the soft, buttery shade of canary yellow this costume sported would seem better fitted to a gentle, bird or perhaps flower based superheroine, not one of the most dangerous men alive. Which is why it’s so impressive that the CW took a look at Reverse Flash’s normal costume design and decided they were up for the challenge. A lot of the intimidation factor is helped by the patches of black and red (color blocking once more to the rescue), and the FREAKING GLOWING RED EYES, not to mention the outstanding performance of Tom Cavanaugh as Eobard Thawne. Still, the actual devotion to (and success of) a bright yellow suit on a truly menacing villain remains an accomplishment of visual design. The red lightning effects make the whole thing really stand out while in motion; the vibrational blur in most of the scenes where the character was otherwise standing still added to the mystery and menace of the character; but even when standing in one place without vibrating during scenes where all the details could be fully observed, this costume still looks good. 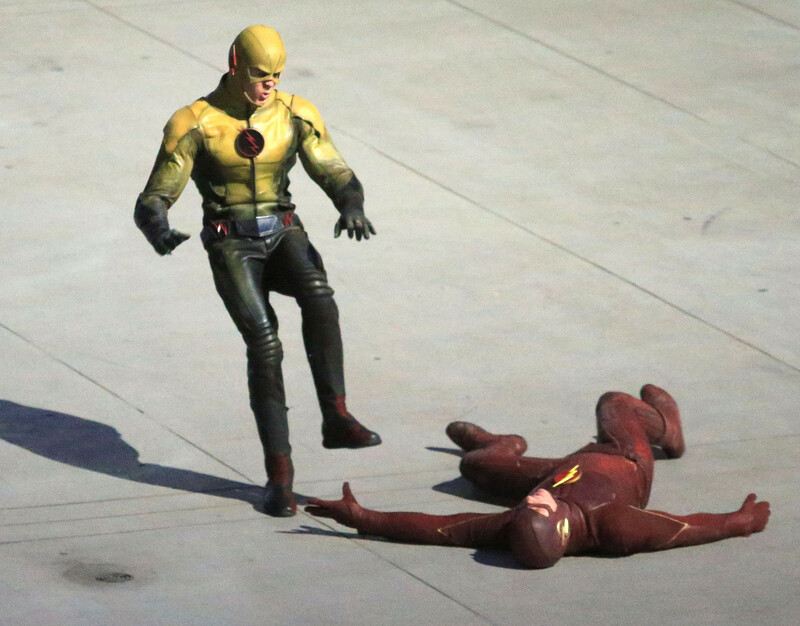 The CW’s visual design for Reverse Flash was one that succeeded in every situation and variation where it has been used, and for that I must commend them. This is one of the best comic book costumes on film ever. The CW’s momentum in creating a shared DC Universe for television continues unabated, and their costume design just keeps getting better. Legends of Tomorrow starts in January, and is expected to deliver on more wonderful costumes, including ones from a variety of time periods; Flash and Arrow will be introducing more characters in the second half of their current seasons, including speedsters Wally West and Jesse Quick. Hopefully the CW will continue improving, making better and better use of color blocking and sleeker, less busy design. Who knows how this list will need to be updated, but I look forward to the costumes of tomorrow.